Card Text Play: Forge a key at +6 current cost. If your opponent has no , forge a key at +2 current cost instead. This allows you to forge a key immediately instead of waiting for the beginning of your next turn. You can forge a key at +6 Æmber cost (12 Æmber by default); or, if your opponent has no Æmber, you can forge a key at +2 Æmber cost (8 Æmber by default). 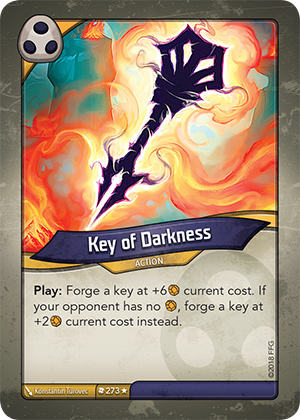 If there are any other cards in play that modify this cost further, those are also applied to the cost of forging a key with Key of Darkness.